The end of the year data always provides an interesting snapshot of the trials and tribulations of the previous year. For beverages, however, it only tells part of the story. Beverage Marketing Corporation just released their year end numbers for 2009, with the headline that consumption declined in 2009 by -3.1%, losing around a nine hundred million gallons from the previous year. Interestingly they estimate that the top 10 beverage brands (responsible for close to 50% of the market) declined at -4.5%, where the smaller brands declined at -1.7%: They also estimate that Gatorade lost an amazing 100M cases (over 10% of the total loss) declining -15%. What the data does not reflect is that the price and profitability of the remaining 28.8B gallons. Those metrics are as positive as they have been in a decade. 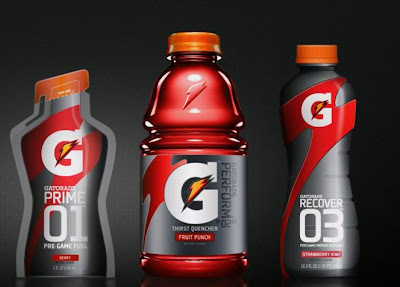 I have written in the past about the challenges that Gatorade faces: Lost occasions to Vitamin Water, a 1970s approach to personality marketing etc etc. Well, their response is finally filtering out. Its the idea of 01 Prime, 02 Perform and 03 Recover. Prime will be a carbohydrate boost before an activity, Perform will be hydration (now without HFCS) and 03 will be a "hydrating protein beverage". Gatorade has only gone 50% of the way. It still feels the need to bang on about rehydration in all its phases rather than understand that engaged consumers in this space. And Caffeine is a legit preparation. And protein is needed for recovery. Probably not. These changes leaves the casual, non-salty refreshment space all to other brands. Interesting discussion in the WSJ about the schools declining in total beverage sales. The data provided is pretty staggering - looking at some of the declines in big school sellers like regular CSDs and Sports Drinks (no wonder Gatorade has issues). The issue of beverages in schools has been a hot one for many years. A decade ago the objection was marketing to kids before they knew any better. Today it is about sugar/obesity. So, is the battle won? Well, hardly likely. Kids will have gone to other places to buy what they want, while schools that benefited from the incremental beverage income are in the process of ending programs and firing teachers that they were funding from rich, multi-year drinks deals. And in the interim, beverage costs have increased and the profitability from the channel is now compromised. Is there a way back? Probably only through innovation. But since kids like the taste of sugar, its unlikely that just offering a limited range of either low sugar or stevia sweetened products. There is no simple solution here, kids want good tasting products, schools need funding, but cannot endorse full sugar beverages, and the beverage industry lacks the right single serve package size. Come back 6 oz Coke bottles, all is forgiven? Liked this story from the New York Times. Apparently consumers - on average - enter a grocery store intending to spend around $40, but with the mental preparation of spending around $60.